Recently, after viewing this illuminating animated GIFs, I realized that finding the closest point on a quadratic Bezier curve to a given point M might be not so difficult ...and very useful for detecting collision between a disk and a quadratic curve. Quadratic Bezier curves are familiar to flash programmers, because these are the curves they draw with functions like Movieclip.moveTo() and Movieclip.curveTo(). Such Bezier curve is defined by 3 points: P0, P1, P2. P0 and P1 are the extreme points, and P1 is a middle point determining curvature. P(t) = (1-t)²P0 + 2t(1-t)P1 +t²P2. t is a parameter variable walking from 0 to 1. When t = 0, you are at point P0, and when t = 1, u're at P2.Each point of the curve has a corresponding "t". The above-mentioned animated GIFs greatly help to "geometrically" grasp not only the quadratic curves, but also higher order Bezier curves . The derivative is a vector representing the "speed" at point defined by P(t). It also has the property to be a tangent to the curve at point P(t). Now let M(x,y) be our point (which can be anywhere) and we want to find out a point P' (defined by t') on Bezier curve that is the closest possible to M.
that is, MP will be orthogonal to the tangent at P.
If we can solve this equation, we get 3 possible solutions for t !! How to solve a third degree equation is explained here (in french). Now we have a maximum of 3 solutions t0, t1, t2 and find the one fitting in [0,1] and minimizing dist(M, P(t)) is easy !! P0 and P2 are the blue points, P1 is green , M is red. The yellow dot is the closest point, the orange dot indicates the normal to M.
The source code (AS2, FLA CS3 + Bezier.as). Translating it into as3 should be no problem . [UPDATE 2012/08/06] I fixed the issue pointed by makc3d. Now the end points are included as a possible solution, which is more consistent. I added a flad "onCurve" indicating if the closest point is on the curve itself (true), or one of the end points (false). The "oriented distance" is negative when the point is on the right of the path formed by [P0,P1,P2]. For backward compatibility, I kept this info in the variable "orientedDist", but it loses its meaning when the closest point is not on the curve. Then, I don't get it.. Can you send me (olive_at_gludion.com) a screenshot showing the problem? no I mean that at certain positions dots just disappear, when they should remain at the segment endpoints. 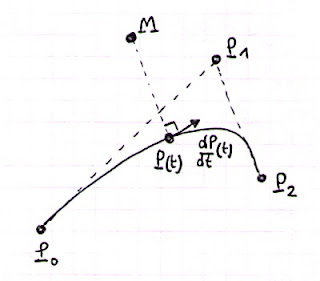 yes, the dots disappear if no point P of the bezier curve meets the condition MP.dP/dt = 0. In this case, the function returns null. In my game, it usually corresponds to a case of point M colliding another curve. But actually you're right, it should provide one of the endpoints in such cases. It's easy to add some code testing which one of the 2 endPoints is closest when the result is null. Those wikipedia gifs are indeed awesome. Thanks for your post! BTW, a complete solution should always check distance to both endpoints (whether or not the result is null) as there are certain cases where this returns the wrong distance because there are a few corner cases in the initial premise - the shortest distance is always tangent to the curve. As you said, if there were always other curves, this this wouldn't be a problem. But with only this curve in consideration, distance is reported as -237, but it's actually closer to the left endpoint. Also, please don't take my comments as critical - I really appreciate your effort and just want it to be more complete. =) Cheers and great work! I will add your suggestion ASAP. Aways great to find complex things simplified. Thank you for posting this! I had some strange results with the code though. So I did the same for a cubic bezier and it work perfectly, giving a 5th degree polynomial. this differ some to your solution. It works for me, just thought I should post it here. a = -2*B.B, because B = P2-2P1+P0. So, I think both our solutions are about the same (probably all your a,b,c,d are multiplied by -2 or 2, which doesn't change the validity of the equation). In my formula, the purpose of A and B was precisely to simplify the expression of a,b,c,d and avoid any reference to P0,P1,P2. Thanks! I suspected it was the same, but I didn't check it. I must have put a sign wrong somewhere in my code. BTW do you know how the formula looks to check if two quadratic bezier's intersect? Or if they don't the points on the curves that are closest to each other? I want to know on which side the point lies. (side where distance is negative or side where distance is positive). Your negative distance is helpful to me. But curious to know how a distance is coming out negative. Thank you very much for posting this. It was exactly what I was looking for for a game I am working on. There is somethink weird going on inside the quadratic (D=0) section. It look, it "snap" to the inflection point thus giving incorrect results. I rewrote your code to HLSL and this image is what I get: http://goo.gl/Ge1PE . Note that even this is special case (P0 == P2), its wrong anytime the angle is too sharp (in my test case up to P0[-80;0], P1[0;0] P2[-80; 50]). I still am not able to find out whats the problem. Have you guys any idea? Thanks! Thank you so much! I've been trying to figure out how to do this for quite a while. It was driving me crazy! It is important to discover distance calculator UK the distance between the two points on the guide.